125th ANNIVERSARY OF THE CATHOLIC MISSION IN ACCRA ORDINATIONS TO THE HOLY PRIESTHOOD, Saturday, August 25, 2018. Sermon: “Blessed be God and Father of our Lord Jesus Christ, who has blessed us in Christ with every spiritual blessing in the heavenly places, even as he chose us in him before the foundation of the world, that we should be holy and blameless before him” (Eph. 1:3-4). My dear brothers and sisters in Christ Jesus, these words of St. Paul to the Ephesians (1:3-4) fill my mind and heart as I praise and thank God for the gift of the Holy Priesthood itself and the Priesthood soon to be bestowed on these 18 deacons before us. Yes, we should bless God and Father of our Lord Jesus Christ, because, in and through the gift of the Holy Priesthood, God in Christ blesses us with “every spiritual blessing in the heavenly places”. 1.1: In today’s First Reading, God instructs Moses to take anointing oil and to consecrate the altar and everything that was to be used in his service; and then to anoint Aaron and his sons, consecrating them too. “Thus, by being anointed, shall they receive a perpetual priesthood throughout all future generations”. Yes, today, by the prayers of consecration and the anointing with the Oil of Sacred Chrism, these sons of ours will be consecrated forever to God and to his service, and, in Christ Jesus they will become a blessing for all their lives to the Church and to all of humanity. Now, since God is holy, he requires of those for his special service like Aaron and his sons to be clothed in the holiness of a perpetual priesthood that finds fullness and fulfillment in his Son Jesus Christ, the Holy and Eternal High Priest (see Heb. 5:1-10). Let us praise and give glory to God for these spiritual blessings in the heavenly places that he showers today upon us in our Archdiocese! 1.2: In today’s Gospel, we read that Jesus Christ “went up the mountain and called to himself those whom he wanted and they came to him. He appointed twelve (whom he also named apostles) that they might be with him and he might send them forth to preach and to have authority to drive out demons”. St. Mark names the twelve apostles, and very interestingly we see that Jesus chose even Judas Iscariot, who would later turn traitor and betray him. God’s ways are truly strange and unfathomable! According to the Gospels, Jesus was in the habit “of going up the mountain” to pray and to commune with God his Father. St. Luke emphatically states that Jesus “… departed to the mountain to pray, and he spent the whole night in prayer to God” (Lk. 6:12). And so, after communicating with God his Father, Jesus chose his twelve apostles, and in them, he also chose each and every one of his followers of old and of today. My dear sons, today, Jesus Christ our Lord, is choosing you to be his priests in the same way. He has spent time in prayer to his Father and has chosen you. St. Mark, in his Gospel, gives the reason for which Jesus chose his apostles saying: “they were to be with him, so that he might send them forth to preach and to have authority to drive out demons”. My dearly beloved, Jesus Christ chooses us first and foremost to be with him, (literally in order to know him and to know everything that he has learnt from God his Father – see Jn. 15:15); and then we are to be sent forth (as his apostles) to preach his Good News, and to cast out evil in his name. So, the priest is chosen not because he is the holiest or the best or the most intelligent, nothing extraordinary, but primarily to be with Jesus Christ; to know him intimately and so become the Sacrament of Christ in and to the world, going to preach Christ Jesus the Word of God and to rescue people from the power of evil and of the devil. Yes, “Blessed be God and Father of our Lord Jesus Christ, who has blessed us in Christ with every spiritual blessing in the heavenly places, even as he chose us in him before the foundation of the world, that we should be holy and blameless before him” (Eph. 1:3-4). St. Paul in this passage says that God the Father “chose us in him (in Christ Jesus) even before the foundation of the world, that we should be holy and blameless before him”. So we are all called and chosen to be holy and blameless before God always. Christ Jesus the Son of God is to be the measure and full stature of our holiness. 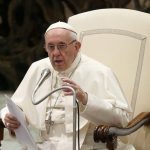 In his Apostolic Exhortation “On the call to holiness in today’s world”, Gaudete et exsultate (Rejoice and be glad), Pope Francis also teaches us that holiness is not just our vocation, nor is it our mission, it is, in fact, our very nature, because the Lord our God who created us in his own image and likeness, is himself holy; and still more, God desires the sanctification all his sons and daughters (see GE 10; Lev. 11:44; 1 Pt. 1:16; and 1 Thes. 4:3). My dearly beloved in Christ, please permit me to quote at length Pope Francis’ Gaudete et exsultate 14: “To be holy does not require being a bishop, a priest or a religious…We are all called to be holy by living our lives with love and by bearing witness in everything we do, wherever we find ourselves. “Are you called to the consecrated life? Be holy by living out your commitment with joy. Are you married? Be holy by loving and caring for your husband or wife, as Christ does for the Church. Do you work for a living? Be holy by laboring with integrity and skill in the service of your brothers and sisters. 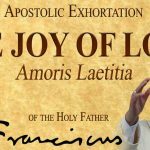 According to our Holy Father, our calling to holiness is the fruit of our baptism saying in GE 15: “Let the grace of your baptism bear fruit in a path of holiness. Let everything be open to God; turn to him in every situation. Do not be dismayed, for you can do this in the power of the Holy Spirit, and holiness, in the end, is the fruit of the Holy Spirit in your life (see Gal. 5:22-23)”. Another beautiful teaching from Pope Francis is that: “Holiness is the most attractive face of the Church” (GE 9). And emphatically, “At its core, holiness is experiencing, in union with Christ, the mysteries of his life. It consists in uniting ourselves to the Lord’s death and resurrection in a unique and personal way, constantly dying and rising anew with him…” (GE 20). “In the end, it is Christ who loves in us, for ‘holiness is nothing other than charity lived to the full’” (GE 21). 1.4: And now, my dear priests to-be, do not forget that holiness is first and foremost our nature; holiness is our calling; holiness is our mission. We are called to be saints, because “every saint is a mission,” teaches the Holy Father (GE 19). The Priesthood you will be invested with today is to be your path to fulfilling your call to holiness as enshrined in the questions you would have to answer and in the prayers that will be prayed for you soon. This is your path to holiness my sons. My prayer for you and the prayer of all the faithful People of God gathered here today because of you, is that you will be holy priests so that you mirror Christ Jesus the Eternal High Priest to the world and witness to him by your very lives. May your life be attractive to all you come into contact with! May Mary the Mother of all Priests always intercede for you so that you may become truly the Sacrament of her beloved Son Jesus Christ, for Mary loves all priests exceedingly well, since she sees in every priest her Son! “O Almighty and Eternal God…increase the gifts you have given to our Church so that we…may grow in holiness of life and be truly ardent disciples of Your Son, Our Lord and Saviour Jesus Christ” (from the 125th Anniversary Prayer). Arise, Catholic Faithful! Rejoice and Renew! 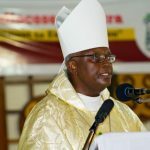 Metropolitan Archbishop of Cape Coast. Our Holy Father says: “To do so, prayer and penance will help. I invite the entire holy faithful People of God to a penitential exercise of prayer and fasting, following the Lord’s command (see Mt. 17:21). This can awaken our conscience and arouse our solidarity and commitment to a culture of care that says ‘never again’ to every form of abuse”. I hereby direct that we spend the whole month of September in prayer and penance for forgiveness and healing, and especially for the conversion and change among us priests and religious in the Church universal and in our Catholic Archdiocese of Accra too. I ask that we hold 72 hour adoration of the Blessed Sacrament from Thursday, September 13 through Friday, September 14 – Feast of the Exaltation of the Holy Cross, to Saturday, September 15 – Feast of Our Lady of Sorrows. I ask the Liturgical Commission to come up with modalities for the Triduum, and some guidelines for the whole month of September. My next big concern is the Holy Spirit Cathedral Restoration; please my dearly beloved in Christ, I would like to be able to raise the Gh Cedis 10 million we have estimated for the Restoration. So far we have been able to raise just about Gh Cedis 3.5 million. I need a further 6.5 million. The Holy Spirit Cathedral fully restored will be my greatest legacy I pray you help me to leave to this Archdiocese. Finally, please do not forget the 125th Anniversary Prayer and the Climax, which, God willing, comes off on Sunday, November 25, 2018, Solemnity of Jesus Christ the Universal King, at the Black Star Square. Sermon: My dearly beloved, the tradition of our Holy Mother Church recommends that today’s Liturgy take place preferably on Holy Thursday, the day in we commemorate the two inseparable gifts of the Lord Jesus Christ to his Church, namely, the Institution of the Holy Eucharist and of the Ministerial Priesthood at the Jewish Passover. Today’s Chrism Mass is taking place this Wednesday, as has become our tradition in our Archdiocese in order to enable all our priests (throughout the Archdiocese) to participate in this all-important liturgy, and be able to return thereafter to your parishes and your flock/parishioners for the Sacred Triduum of Holy Thursday, Good Friday, and the Paschal Vigil and Celebration of the Resurrection. It is at this Holy Mass of Chrism, that the Bishop is required to bless the Oils, namely that of Catechumens, and that for the Anointing of the Sick, and then together with his priests, the Bishop consecrates the Oil of Holy Chrism. It is at this Holy Mass also that all priests, both Diocesan and Religious in this Archdiocese, are expected to make the Renewal of our Priestly Commitment. Now, taking cue from the theme of our 125th Anniversary: “Renewing our commitment to Evangelization”, I see some connection or resonance with the Renewal of our Priestly Commitment that will take place soon after this sermon. But before then, a reflection on the readings! Of those God has anointed, Isaiah prophesied: “you will be named ‘priests of the Lord’, they will call you ‘ministers of our God’… all who see them will admit that they are a race whom the Lord has blessed”. 1.2: This special calling and anointing and blessing and sending on mission as prophesied by Isaiah in the First Reading is what Our Lord Jesus Christ took upon himself at the start of his earthly mission, his sending by the spirit to bring the good news to the poor… his mission of evangelization. Yes, when God calls us for a mission, he empowers us in the Holy Spirit, conforming us to his Son Jesus Christ. 1.4: And so my dearly beloved, today we are celebrating, yes, our calling and anointing as the priestly, kingly and holy people of God. We are “priests of the Lord”… and “ministers of our God”… We are indeed “…a race whom the Lord has blessed”. This is what we become in Christ Jesus, thanks to the anointing with the oils, most especially the Oil of Holy Chrism. The Oil of Catechumens which is used before Baptism gives the catechumen inner strength and grace to be victorious over sin and evil, and the anointing with the Oil of Holy Chrism configures the baptized to Christ, the Anointed One of God. That is what the title Christos means. My dearly beloved, it is this same Oil of Holy Chrism that the Church uses in the Sacrament of Confirmation and especially for the Ordination of Priests and the Consecration of Bishops. It is also used for the consecration of Altars and Church buildings, making them holy and sacred to the Lord (see Ex. 40:9-10). The Oil of the Sick is blessed and used for the anointing of the sick and the infirm as was done in the times of the apostles of Jesus at his behest, (see Mk. 6:13 and 16:18; and James 5:14ff.) It points to the fact of our faith that Jesus the Christ and the Lord, and Saviour of humanity is among us, and is still at work in our midst thanks to the sacraments of the Church. Christ’s mission of evangelization is for all, and this day calls on us all to renew our commitment to that mission. I began this sermon saying that I perceived a spiritual resonance in the theme of our 125th Anniversary and the liturgical rite that today all priests are required to perform religiously and conscientiously, namely, to renew our priestly commitment. My dearly beloved in Christ Jesus, dear Priestly, Kingly and Holy People of God, my dear brothers in the Holy Priesthood and Religious Life, without any shade of doubt, I can say that “the spirit of the Lord is upon you and me, and he has anointed you and me, and he has sent us to proclaim the good news to the poor…” in the Catholic Archdiocese of Accra, as our theme says: “125 Years of Catholic Mission in Accra: Renewing Our Commitment to Evangelization”. 1.6: Let me now, therefore, invite you, my dear brother Priests and Religious, to rise up and once more renew our priestly commitment supported by our beloved Parishioners, Religious Men and Women. Through the Immaculate Heart of Mary, may our renewal this year also be acceptable unto the Lord our God. Amen! Dearly beloved in Christ Jesus, we, the Catholic Bishops of Ghana, wish to use this Lenten Pastoral Letter to call for personal and national renewal as we all work towards a more peaceful and prosperous Ghana beyond 60 years of Independence. Personal and national renewal cannot be realized without true obedience to God. Providentially, the Gospel reading of the First Sunday of Lent (Mark 1.12-15) serves as a point of departure for a sober reflection on our obedience or disobedience to God. The latter is, invariably, preceded by temptations. In a comparatively brief account, St. Mark, narrates the temptation of Jesus. The place of the temptation and the length of time Jesus spent in the desert are corroborated by St. Matthew and St. Luke in their accounts. 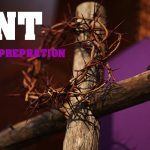 The scene of the temptation according to St. Mark sheds light on the Christian struggle especially during this season of lent. Every Christian is invited to tame within his or her heart the wild beasts of disobedience and to learn through the discipline of fasting, prayer and good works to incline our hearts like the angels to perfect obedience. In the light of the above, we wish to reiterate and reflect further on a point made in our 2017 Lenten Pastoral Letter which was issued at the beginning of the 6oth anniversary of Ghana’s Independence. We mentioned that it is very significant that our national anthem begins with the word “God”. Unless Ghanaians and all other inhabitants of Ghana learn to obey God and actually remain obedient to Him, the realization of our national dream for Ghana @ 100 will be a mirage. The angelic posture of obedience to God, rather than the unruly nature of wild beasts, should characterize all aspects of our personal, familial, socio-cultural, economic, legislative, executive, judicial and religious lives if the dream of a peaceful, prosperous and highly developed Ghana is to be achieved. In what follows, therefore, we wish to highlight a few instances of obedience and disobedience to God in various aspects of our personal and national lives. It is hoped that we would henceforth desist from acts of disobedience and progressively embrace the life of true obedience to God. From the very beginning of creation, God designed marriage as the foundation of family life and families as the basic units of society. We obey God when our choices and actions promote and foster marriage and family life in line with the purposes of God. On the other hand, we disobey God when our chokes and actions break down marriages, reconstitute marriages as unions other than what God established between a man and a woman, children disobey parents, parents shirk their responsibilities, etc. Each people or nation has its cherished customs and cultural values; and our beloved country is no exception. Some of these customs and values may be modified or changed with time. The critical questions, however, are: does the original custom or value contradict the will of God? Is the modification or change in line with the will of God or it contradicts it? If we take, for instance, the cultural value of respect for the elderly, this certainly rhymes with the will of God. Therefore, the present trend of disrespect for the elderly is a social change which amounts to a disregard of the will of God. As mentioned on, temptations may lead us to disobey God. One of the temptations which befell our Lord Jesus Christ was to turn “stones into bread”. Happily, the Lord overcame the temptation by remaining obedient to His Father’s will because His actual “food is to do the will of’ His Father (John 4:34) and not physical bread. The temptation to turn “stones into bread” is still with us today. As stones are not the natural raw materials for making bread, so any economic gain or advantage from an unnatural (illegal or illegitimate) source could be referred to as turning stones into bread. In other words, all actions of bribery and corruption amount to turning stones into bread. Like the Lord Jesus, who overcame the temptation in His forty days of fasting and prayer, and remained forever obedient to His Father, we should use the forty days of Lent to seek the grace of mastery not over the hardness of physical stones or over our hunger for physical bread but rather over the desires of greed, discontentment and the like which lead to bribery and corruption etc. Another temptation that Jesus experienced was a call to worship the devil (Matt. 4:8). But, once again, He set the records straight: only the Almighty God deserves worship. This temptation also implies any sort of compromise that goes against the will of God. For those who have the duty to make laws for our country, the question is: do internal (local) or external (foreign) pressures tempt them to compromise in the law-making process? How do they act when the voices of their consciences are loud and clear that such compromises contradict the will of God? When our legislators thus compromise, it is the dreams of the pressure• givers that are likely to be realized and not our collective glorious dream of Ghana@ 100. Our legislators must, therefore, not allow such persons or organizations to set and drive the agenda for the future destiny of our country. Like the members of the legislature, members of the executive arm of government in Ghana are not immune from internal and external pressures for compromise. On the other hand, the next temptation connotes sensationalism or the lure of the spectacular or achieving vain popularity or fame may be experienced also by the executive. Jesus was tempted by the devil to put His Father to the test by throwing himself down from the pinnacle of the temple of Jerusalem and expect angels to hold Him up (Matt. 4:5-6). Once again, Jesus overcame the temptation by putting the will of His Father first, instead of putting God to the test. Just imagine Jesus descending from the pinnacle of the temple and being surrounded by the majestic wings of angels in full view of the thousands in Jerusalem; if this had happened surely the saving mission of Christ’s crucifixion and resurrection would have been thwarted. Similarly, sensationalism or the lure of being spectacular or achieving vain popularity or fame by the managers of the affairs of the nation only leads to short-sighted decision-making often to satisfy apparent short-term needs which actually do not feed into achieving the long-term dream of Ghana @ 100 .. Members of the executive and legislature of our nation should therefore learn from Jesus and act only in accordance with the will of God. Members of the judiciary, like the legislators and executive, are also not immune from the temptations of turning “stones into bread”, of compromising and of vain glory. In recent times, unfortunately, instead of choosing the path which portrays obedience to God, some have succumbed to one or more of the above-mentioned temptations. Our nation can make good progress only if, while the other two arms of government are complying with the will of God, members of the judiciary also do same. We, therefore, urge them as well as the members of the legislature and executive to emulate the excellent example of Jesus Christ in the face of temptations. In a word, the guiding principle of all should be always God, and by implication, His will for Ghana must be first. Are religious leaders exempt from the three temptations mentioned above? Not at all! Unfortunately, many religious leaders have fallen prey to the temptations of turning “stones into bread”, sensationalism or vain glory and compromising in matters of faith and morals. For instance, on the Christian scene in Ghana, Christian leaders are turning “stones into bread” by demanding “consultation fees” and selling so-called “anointing oil and water”, etc. Is this in line with the will of God? We certainly doubt that it is. With regard to sensationalism, some pastors or evangelists or prophets “stage manage” miracles. We urge all those involved in such acts to seek true spiritual renewal. For, by their present actions, they are leading too many people astray. This is clearly in contradiction to Christ’s mission of gathering together the scattered children of God and not losing anyone whom the Father had entrusted to Him. As regards compromises by Christian leaders, may it suffice to mention the following: some married Christian leaders have divorced, some have allegedly obtained “miraculous” powers through unchristian means and others sometimes interpret the Bible in ways that contradict fundamental Christian beliefs. We urge, our fellow Christian leaders as well as ourselves to strictly follow the example of Christ who never compromised. Indeed, it is very sad to note that because of the failure of many Christian leaders to overcome the trio of temptations, the “brand” of Christianity being paraded today in Ghana promotes all kinds of vices. Certainly, this trend, if it does not change soon, will make the dream of Ghana @ 100 a mere mirage even if the three arms of government play their part very well. “Return to me with your whole heart, with fasting, weeping, and mourning. Rend your hearts, not your garments and return to the Lord your God.“ (cf. Joel 2:12-13a). Dear beloved, as the Prophet Joel states, we appeal to all and sundry to use these forty days of Lent for personal and national renewal. We have underlined the fact that fundamental to this renewal is obedience to God. We, therefore, pray that most (if not all) Ghanaians will embrace the call to obedience to God, so that our nation will steadily develop in the course of years and decades, and that those who live to see Ghana @ 100 will become great “exporters” of the unique Ghanaian product of “obedience to God is key to national excellence”. Have a spirit-filled Lenten season. President, Ghana Catholic Bishops’ Conference. For his generosity to me? Witnessed by all his people. You have undone my fetters. With these words, my brothers and sisters in Christ gathered in this Cathedral, I greet all of you as I thank Archbishop Palmer-Buckle for asking me to be the homilist for his silver jubilee of Episcopal ordination. This was just when he was saying good bye to me in the bishop’s house in Koforidua after the climax of the silver jubilee of the creation of Koforidua diocese. I wish to assure you all that this may in the long run turn out to be anything but a homily. How could I have turned down this request? I took over the administration of CDK from him and more importantly he was the principal celebrant for my Episcopal ordination. Charlie, please, have it already in mind if by God’s grace I am able to hit 25 you will surely be asked to say a few words for your younger brother, Agyaaku. 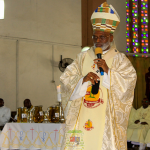 Twenty five years as a bishop/archbishop! Hmmm!! Many are the things that have happened for which time will not allow me to put them out here in this celebration. I will try and briefly highlight on some to make my point. I remember when he was ordained bishop of Koforidua, he had very wonderful black hair and beard. I still can picture you but look at what 25 has done to him. Please do not look at mine. It tells you that the ministry is not a simple one even though it is the work of God. 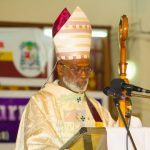 I recall very well when he started in Koforidua and for the first few years referred to himself as an apprentice bishop. He did his best to wean himself of this status and I think now you qualify to be referred to as a very seasoned Archbishop. Whatever is the situation, we need to join him in thanking the good Lord for having sustained him in faith and in the ministry of shepherding His flock in both dioceses of Koforidua and Accra. We in Koforidua are proud that we prepared him for Accra. We are using the readings of the solemnity of Epiphany, a feast that celebrates the visit of the Magi during which they presented their gifts of gold, frankincense and myrrh to the new born Saviour of the world. These were very precious and symbolic gifts. We join and walk in the footsteps of the Magi with the assurance that through our acts of faith in life we can also let others come to know Christ. Besides that, you will also agree with me Charlie, that, you have been presented to Mother Church as a precious gift and so will encourage you to use your gifts and talents in the continual development of the Church. As chief shepherd and through all these years of ministry you have tried to serve the Lord in the people entrusted to your pastoral care. At the time that the prophet Isaiah prophesied in Chapters 60-62, Jerusalem was still in ruins, still a city forsaken. The prophet’s message was therefore to encourage them, to rise up in splendor because their light had come. Our present society and for that matter, our world is struggling with all kinds of social evils, moral decadence of all kinds. Our nation is not exempt from these. For example, bribery & corruption is rife in every aspect of the Ghanaian society which is a concern to many, homosexuality, lesbianism, some negative aspects in partisan politics etc. Since becoming a bishop/archbishop you have not relented in speaking your mind about these and many there are who have applauded your courageous stand on such social cankers. I should be quick to mention here that there are others who have also not spared you and even gone as far as asking you to put off your clerical garb and wear a political colour. Like the prophet Isaiah you have at the same time encouraged your flock about the fact that the light of God will continue to shine upon them. This is what your prophetic role entails, to encourage and condemn where necessary. It was not surprising that the then President of the Republic of Ghana, His Excellency J. A. Kuffour appointed you as one of the eminent members of the National Reconciliation Commission (2002-2004). That, also, came with all kinds of criticisms even as you were asked to serve on this important national Commission. Beginning your episcopate in Koforidua, certainly, was not easy. You had to build it all from the scratch, no permanent secretariat, accommodation, staff etc. you moved on slowly but surely until some of the main structures were in place, temporal office space, diocesan pastoral & training centre, etc. You went through the length and breadth of the diocese, including the present Donkorkrom Vicariate, riding in small boats in the night with Fr. Otmar Auinger, SVD, Fafanyo etc. on the Volta lake in the night and during the day. All this was your humble effort in bringing the Good News to the people far and near. You did your best to bring the people of God together and to make them proud of their faith. Ma wani ngye se woye Romani, was one of your famous songs with the people. You were the one who introduced the regular catechesis in the St. George Cathedral and in all the parishes and outstations you visited explaining the Church’s teachings and the scriptures to the people. These made very positive impact on the people and many have benefitted from this practice of yours. 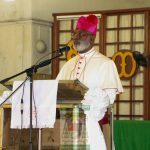 Besides this you also introduced the Bible Youth Camp around the Christmas season for young adults and students in second cycle institutions from the entire diocese. The impact has been tremendous. I cannot but mention your special love and charism in taking care of poor and needy children. Sometimes I could not understand your spirit of perseverance even in the face of some disappointing beneficiaries. Some of such children have even been named after you, full name. With your brotherly, priestly love and affection you never relented in your efforts at uniting the presbyterate of Koforidua and this spirit, I can say to a large extent is still working. You will stop at every parish on your way to some place and just say hello to the priests; what we termed, stations of the cross. Permit me to enter a bit into his personal spirituality. This is a pastor who does not go to bed until he has prayed all the five decades of the holy Rosary, no matter how late in the night. With all these you have positively influenced so many people unknown to yourself. When it comes to your episcopate in Accra, I wish someone else would have continued from here. My dear brother, what I have said above apply as far as I can get the feeling from some of the parishioners and priests in Accra. 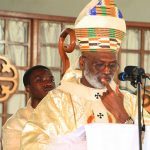 Certainly Accra has its own peculiar pastoral needs and challenges as it is but you have not relented in placing your pastoral, administrative skills in running the Archdiocese. I can mention without fear that quite a number of your priests are also receiving further education in different disciplines within and outside the country to enhance their pastoral engagements. I can see the springing up of new parishes in almost all the growing areas of the capital. You have in place a Youth formation centre, Catechetical training centre. You organized the second Archdiocesan Synod to brainstorm on very pertinent pastoral concerns for the Archdiocese. The Acts of this Synod, I believe are helping and guiding in the pastoral drives of the parishes. It was during your episcopate that the Archdiocese celebrated her 120 years of evangelization and presently preparing to celebrate the 125 anniversary. You have embarked on the restoration project of the Holy Spirit Cathedral. I humbly entreat you, my dear People of God to put your weight behind this effort so that this very Cathedral can be refurbished to the greater glory of God. As our Metropolitan, I would like to encourage you to leave no stone unturned in building up our Province. Be assured of your suffragan dioceses’ readiness to support all the positive moves in having a united province. On the National level, I wish to thank you sincerely for your wonderful contributions and the amount of knowledge you bring onto the floor of the Ghana Catholic Bishops’ Conference deliberations. My dear People of God, our celebrant will be the first to admit that his calling to the holy Catholic priesthood has been through the grace of God. Left to him alone he accepts that he is even unworthy, but still the Lord who knows the hearts of His children has chosen him and ordained him for His work. He has been humble enough to admit his own shortcomings and ever ready to renew himself in the sacraments offered by Mother Church. He aligns himself with the mission of Jesus who came not to call the upright of hear but sinners to conversion (Lk. 5:31-32; Mk. 2:17). He has tried fervently to share his faith experiences with others. I can hear you repeating with the Psalmist: “What return can I make to Yahweh, for his generosity to me? I shall take up the cup of salvation and call on the name of Yahweh. I shall fulfill my vows to Yahweh ..” Ps.116:12. The Church in Accra needs you still to strengthen them in the faith. A journey that requires enormous prayer and sacrifice! Strive relentlessly for the unity of the clergy & religious. I wish therefore to entreat all to intensify your prayerful support for our brother. Continue to show love to him, because I know he loves his Church and vocation. Continue to offer thanksgiving sacrifice on his behalf so that he can minister still well to the flock entrusted to his care. Accra and its pastoral needs can be complex and can be demanding. May Mary, the Mother of priests and your patroness continue to intercede for you always! Congratulations and I wish you many more fruitful years in the episcopacy. Bishop, Catholic Diocese of Koforidua. Sermon: My dear brothers and sisters in Christ Jesus, I asked that we maintain the very readings of today, Friday, January 12, 2018 of the First Week in Ordinary Time. They teach us a lot for this year’s diaconate ordinations. Before I say something about the Diaconate, let me share a thought or two with you on the readings. 1.1: The First Reading taken from the First Book of Samuel selected verses of Chapter 8 recounts how the elders of Israel came to the Prophet Samuel at Ramah to demand a king to govern over them: “Give us a king to govern over us,” they said to him. My dearly beloved, this is the temptation we always go through; God has chosen us and set up apart to sing his praises; to reflect his love to those around us; …and yet we are very often content to be just like the others. How often do you not hear Catholics ask, why should be we be different? Why can we not do just the same way as the other Churches are doing? How often do we not find it difficult to be truly the chosen ones of God, called to reflect the glory of God to the rest of the world! My dear sons, today, you are going to be set apart as deacons of the Lord God through this ordination to the Order of Deacons; and later on in the year, God will elevate you to the Holy Priesthood. You are today going to be set apart in order to lead and serve God’s Chosen People in the Holy Roman Catholic Church. Please, do not be led astray by the temptations of the world out there. He, who has called you, today will set you apart for himself and for the service of his people. Please listen to the voice of the Lord and not that of the world around. Lead the people in a life of service as the Lord your God will require of you. In other words, your faith can help those around you or whom you know sick and needy of the help from Jesus Christ the Lord. Let us, therefore, never give up praying for and bringing into the presence of the Lord Jesus Christ our friends who are sick and needy. Thanks to our faith, Jesus who notices everything can go on to do the needful for them. This is why we should always be praying for others, even non-believers or those absent from the physical presence of the Lord. Our faith can save them! What else can we learn from today’s Gospel? Jesus who is God knows that sin impedes the grace of God from working fully in a person who may need God’s healing power to work in them. So Jesus Christ, the Son of Man who has power to forgive sins, goes on to say: “Son, your sins are forgiven!” Jesus forgives his sins. My dear sisters and brothers, let us never take sin for granted; even a small sin can hinder the grace of God from being effective. That is why Jesus has given us in the Church the Sacrament of Penance and Reconciliation, so that we can always be washed clean of sin and be properly disposed to obtain the full miraculous works and healing we need. Please when you go to confession, just do the penance you are given religiously, however very simplistic it may sound, so that the grace of God will be effective in you. And for you my sons, you who are going to be made deacons this evening, never ever take sin for granted; go religiously for confessions so that the grace of God will be able to effect the miracles in and through you for the people of God. Always, bring the sick and needy to Jesus Christ like the four friends did and may God give them healing through your selfless service to the People of God. 1.3: Now to our diaconate ordination: the Holy Order of Deacon gives us the grace of service, the grace of Christ-like service. In the teachings of the Church, according to Lumen gentium 29, this is what the diaconate entails as duty and ministry in the Church: “…it pertains to the deacon: to administer Baptism solemnly; to protect and distribute the Eucharist, assist at and bless marriages in the name of the Church, bring Viaticum to the dying; read the Sacred Scriptures to the faithful, instruct and exhort the people; preside over the prayer and worship of the faithful, administer sacramentals, and officiate at funeral and burial rites. “Dedicated to duties of charity and administration, deacons should be mindful of the admonition of Saint Polycarp: ‘Be merciful and zealous, walking according to the truth of the Lord, who made himself the servant of all’”. Serve God’s people selflessly, in fact in the footsteps of Jesus Christ through your promises of Obedience, Poverty and Celibate Chastity. These Evangelical Counsels make you Christ-like in your life of Pastoral Charity. Only in this way will you be able to bring Christ Jesus to the People that God sends you and the People to Christ Jesus the Way, the Truth and the Life. 1.5: My dear People of God, let us also pray constantly for your sons as God makes them his deacons that they truly serve like Jesus Christ who came not to be served, but to serve and to give his life in ransom for the many (see Mt. 20:28). May Mary the Mother of Deacons intercede for our sons and give us many more priests in the Archdiocese of Accra! 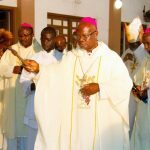 ADDRESS FOR THE LAUNCH OF THE CELEBRATIONS OF THE 125TH ANNIVERSARY OF THE CATHOLIC MISSION IN ACCRA ON THURSDAY, SEPTEMBER 21, 2017, AT THE HOLY SPIRIT CATHEDRAL, ADABRAKA, ACCRA. For his great love is without end. ‘His love is without end!’” (Ps: 118:1-3). And now, let the Archdiocese of Accra say it: His love is indeed without end! Greetings and Welcome: My dearly beloved sisters and brothers in Christ Jesus, all you of the Archdiocese of Accra, nearly five years ago, precisely on November 24, 2013, on the Solemnity of Our Lord Jesus Christ, King of the Universe, it was with these words of the Psalmist that I joyfully began and pronounced the official closing of the year-long celebrations of our 120th Anniversary of the Catholic Mission in Accra, at the Black Star Square in Accra, and I inaugurated with great hope and expectation the 125th Anniversary celebrations for 2018. Surely, we all thought, well, let us see when that will be! Today, thanks to the unfathomable graces of God, here we are at the launch of the celebrations of the 125th Anniversary of the Catholic Mission in Accra. Yes, five or so years ago, we set off on this spiritual pilgrimage, a journey of preparation (individually, communally, parochially, and archdiocesan), and now our feet are truly standing on the threshold of the gates of our Jerusalem; our 125th Anniversary Jubilee celebrations. Yes, let the house of the Archdiocese of Accra say: God’s love is indeed without end! I am happy to welcome you one and all to this event. Permit me to repeat ditto-ditto parts of my address at the launch some five years ago of the 120th Anniversary celebrations which took place here on July 02, 2013. I am saying this lest I be accused of plaigiarism of my own earlier address. I will give a short historical panorama, then I will highlight some of the events lined up for this Jubilee celebration, and I will end with some exhortation to you all. Our 125th Anniversary celebrations will start on Saturday, December 02, 2017, and close on Sunday, November 25, 2018, on the Solemnity of Christ the King with Holy Mass to climax it all again at the Black Star Square in Accra, God willing. Again, this will be a year-long celebration throughout the entire length and breadth of the Catholic Archdiocese of Accra. A short historical panorama: For your information, the Catholic Church in Accra began with the first Holy Mass on the soil of Accra on January 31, 1893, by Rev. Frs. Otto Hilberer and Eugene Raes, two priests of the Society of African Missions (SMA) who were sent from the Elmina Mission that had started in 1880. In the same 1893, the first Catholic Baptism in Accra took place of Mr. Louis James Buckle on May 25, and the first Holy Matrimony was celebrated between Herbert Cheetam and Rose Mary Quaye on August 12, 1894. However, in 1895, the Accra Catholic Mission had to be closed down for Frs. Hilberer and Raes to return to Elmina to take up priestly duty there as a result of the successive deaths of their SMA confreres in that Mission due to tropical illnesses of malaria and yellow fever. 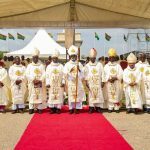 The Catholic community of Accra was, therefore, left in the care of a Church committee led by Messrs Andoh, Brown and Yankah. It was only in 1924 that Rev. Fr. Joseph Stauffer SMA was posted to Accra, and he purchased an old cocoa shed situated on the Derby Avenue, which he later refurbished and turned into a chapel that was dedicated in 1925 as the Sacred Heart Church (of today), the premier Church and parish of Accra. The SMA Fathers ministered to the growing Catholic community here until 1939 when they handed over the then Eastern Province of the Gold Coast colony to the Society of the Divine Word Missionaries (SVD). Rev. Fr. Adoph A. Noser SVD became the first Superior of the Accra Mission. In 1947, Fr. Noser was appointed the first Bishop of Accra, and on February 08, 1953, he laid the cornerstone of this magnificent Holy Spirit Cathedral. In the same year, Bishop Noser was transferred to Papua New Guinea to be the Archbishop of Alexishaven. 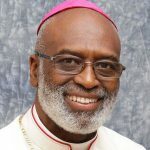 He was succeeded as Bishop of Accra by Rev. Fr. 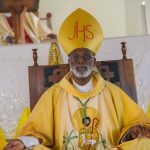 Joseph Oliver Bowers SVD, JCL., an African-Caribbean from the Commonwealth of Dominica, who became the first black bishop of the Gold Coast. 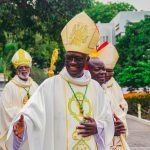 After three decades of solid, foundational missionary work here, in 1971, Bishop Bowers was transferred to the West Indies, his hometown, and he was succeeded by the first Ghanaian Bishop of Accra that same year, in the person of the Most Rev. Dominic Kodwo Andoh DD., JCD, my predecessor. 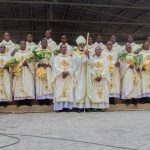 It was during Bishop Andoh’s episcopacy that the Catholic Diocese of Accra was elevated to the status of a Metropolitan See in 1992, and the Catholic Diocese of Koforidua was created by Pope (now St.) John Paul II. 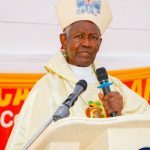 Archbishop Andoh, the first Metropolitan Archbishop of Accra, led this Archdiocese to celebrate the Centenary of the Catholic Church in Accra in 1993, and he retired in 2005. The rest is recent history! 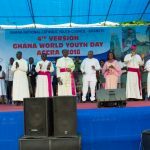 Theme and programmes for the Jubilee: The chosen theme of this Jubilee is “125 Years of Catholic Mission in Accra: Renewing our commitment to Evangelization”. It was inspired by the theme of the Second Synod of our Archdiocese celebrated in February 2009. To refresh our minds, the theme of the Synod was: “Renewing the Church and fulfilling our Vocation and Mission in the Catholic Archdiocese of Accra in preparation for its 125th Anniversary”. Here in my hand is a copy of the Acts of that Synod, and, for the past ten years almost, we have been implementing the recommendations that were given for the strategic development of our Archdiocese, spiritual, financial, material and institutional. 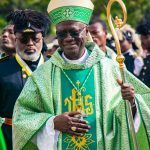 Sometime during these Jubilee celebrations, I believe, we shall have to have an Archdiocesan Pastoral Congress in order to give account of the state of the Catholic Archdiocese of Accra to you, my dear People of God. It was also decided to maintain as our Archdiocesan Logo a slightly modified version of the 120th Anniversary Logo. This will from now onwards be the official logo for the Archdiocese of Accra until another decision is made in the future. My dear brothers and sisters, my dear priests and religious, here is a copy of the 125th Anniversary programme of activities! The celebrations should involve all Catholics of the Archdiocese in all our outstations and parish communities, in all our Church societies and pious associations, our apostolates and ministries. We are going to have celebrations on deanery as well as on Archdiocesan levels, of course. Parishes and deaneries are to put in place their own local organizing committees to work hand in hand with the Archdiocesan 125th Anniversary Celebrations Committee. the spirit of fellowship and communion among the Church members, Church societies, parishes and in the Archdiocese, as well as with the universal Church (see Acts. 2:42-47). The next event of importance is the Commemoration of 125th Anniversary of the First Holy Mass in Accra scheduled for Wednesday, January 31, 2018, at 14.00 GMT to take place where the SMA missionaries first celebrated Holy Mass on the soil of Accra. We are hoping to celebrate the Holy Mass in Latin, and follow that with a candle light procession with the Blessed Sacrament through James Town to the Sacred Heart Church on the Derby Avenue, Accra. and the 125th Anniversary Jubilee Lectures in Accra and Tema Metropolises. The rest are in this brochure for you to keep and observe. They will be communicated to you in the various parishes, outstations and rectorates. Yes, indeed, the Lord our God has been good to us in the Catholic Mission of Accra. 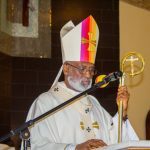 In the last 125 years, He has blessed us and we have grown from a mission station into the Metropolitan Archdiocese of Accra, the Catholic Diocese of Koforidua, and the Apostolic Vicariate of Donkorkrom. We cannot enumerate the number of the Churches and chapels, educational facilities, from first cycle through secondary, vocational and technical to tertiary, hospitals, clinics and other health-care delivery as well as the many social services institutions, etc. Yes, here and now, our feet are standing within the gates of our Jerusalem, on the threshold of the 125th Anniversary Celebrations of the Catholic Mission in Accra. It is our hope and prayer that we will complete this year-long celebration under the maternal protection and solicitude of Mary the Immaculate Heart, Patron of our Archdiocese, whom we have been celebrating as Our Lady of Fatima in this Centenary Year. My dear People of God, it is with the utmost sense of humility and gratitude that I now declare officially launched the celebrations of the 125th Anniversary of the Catholic Mission of Accra, in the name of God the Father, God the Son and God the Holy Spirit! Amen. St. Peter Claver, pray for us! All you Holy Martyrs of Uganda, pray for us! And may St. Matthew on whose feast day we launch our 125th Anniversary Celebrations intercede for us! Arise Catholic Faithful! Rejoice and Renew! “Now to him who by the power at work within us is able to do far more abundantly than all that we ask or think, to him be glory in the Church and in Christ Jesus to all generations, forever and ever. Amen!”(Eph. 3:20-21). 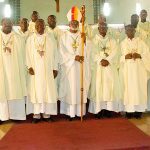 PRIESTLY ORDINATIONS FOR THE CATHOLIC ARCHDIOCESE OF ACCRA ON SATURDAY, AUGUST 26, 2017. Sermon: “The Eucharist and the New Evangelization”, Mary, Our Lady of Fatima and the Holy Priesthood are some of the various thoughts that come to my mind for today’s Ordination sermon. 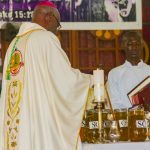 HOMILY FOR HOLY MASS OF CHRISM 2017 IN THE YEAR OF GHANA @ 60. Sermon: “You are a chosen race, a royal priesthood, a consecrated nation, a people set apart to sing the praises of God who called you out of the darkness into his wonderful light” (1 Pt. 2:9). My dearly beloved in Christ Jesus, I chose this text from the First Letter of St. Peter, because it spells out the very import of the celebration of the Mass of Holy Chrism. 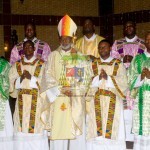 HOMILY FOR THE ORDINATION TO THE DIACONATE AT ST. JOHN THE BAPTIST PARISH, ODORKOR-ACCRA ON FRIDAY, JANUARY 06, 2012. Sermon: My dear brothers and sisters in Christ Jesus, on the Feast of Epiphany, the Church invites us to meditate on the visit of the wise men from the east to Jerusalem in search of the “infant king of the Jews”. This story of the Magi, or of the astrologers as they are often called, is only narrated by St. Matthew in his Gospel. There is so much that you and I can learn for our spiritual development from the episode, but for this evening, permit me to dwell on the text: “The sight of the star filled them with delight, and going into the house they saw the child with his mother Mary, and falling to their knees they did him homage. Then, opening their treasures, they offered him gifts of gold and frankincense and myrrh” (Mt. 2:10-11). 1.1: The Feast of Epiphany commemorates the presentation of the Messiah to the world of the Gentiles, the world of the non-Jews. According to the teachings of Holy Mother Church, St. Matthew, the Jewish Gospel writer, narrates this visit in such detail in order to emphasize the Good News that Jesus Christ did not come as Messiah for only the Jews, “the Chosen People”; he came to save all of humanity, even the non-Jews who, through their own sciences (for example the science of astrology), come to know God and recognize Jesus as King of Kings, as Lord of Lords and as the Conqueror of Death, the one who ushers in the Resurrection. St. Matthew reports that “after Jesus has been born at Bethlehem in Judaea…some wise men came to Jerusalem from the east. ‘Where is the infant king of the Jews?’ they asked. ‘We saw his star as it rose and have come to do him homage’”. We are not sure from where in the east, but we are informed that they were wise men who were certain that from their science of astrology, the star they had seen as it rose indicated the birth of “the infant king of the Jews”. They were convinced of the identity of the one whose star they had seen and they were therefore coming “to do him homage”. Now, why would foreigners, some people from the east, want to come and do homage to “the infant king of the Jews”? Is it not strange that even the Jews themselves, their chief priests and scribes and their king, Herod himself, did not seem to have noticed anything extraordinary at the time? It took “some wise men from the east” to awaken the Jews, the Chosen People, their priests and scribes and even their king to the news that “the infant king of the Jews” had been born. And thanks to the enquiries of the wise men from the east, the chief priests and scribes of the people were compelled to re-read their Books of the Law and the Prophets in order to ascertain that “the Christ was to be born ‘at Bethlehem in Judaea’’’. 1.2: My dearly beloved, the truth, or better put the good news, is that God in his own wisdom knows how to bring all people, especially those who seek him, to knowledge of the Saviour and Messiah, knowledge of the salvation he has prepared for humanity. What is important here now, or what we learn for our lives of faith, is that we should be ready to follow the “star” that rises from time to time in our lives and seek from others who may know so that they may lead us to a better and deeper knowledge of God. That is what the wise men from the east did by going to King Herod in Jerusalem. After all, they were looking for the “infant king of the Jews” who had been born; and that event had to be in the palace of the king in Jerusalem, the capital of Judaea. 1.3: “The sight of the star filled them with delight…”: Now having been informed by the Jewish chief priests and scribes, and following what they were told, the wise men are blessed with the reappearance of the star which fills them with delight and leads them to where they find the infant king of the Jews. My dearly beloved in Christ Jesus, in our life’s journey of faith, there are times of darkness and doubt. The star we once had seen may disappear; that is the time we should never despair of God. Let us go on seeking. When God sees our effort at seeking and enquiring, he rewards our steadfastness with the reappearance of the star in our life’s journey; it then brings us to where we find delight in the Messiah Son of God, because our faith and hope encounter the love of God in the person of Jesus Christ. 1.4: “Then, opening their treasures, they offered him gifts of gold and frankincense and myrrh.” The sort of gifts these wise men from the east brought out of their treasures has very deep, indeed, mystical meaning. Gold in those ancient days represented nothing but the most precious of gifts given especially to kings and royals. Frankincense in the east represented devotion to the divine, in fact, adoration to God only. Myrrh is symbolic of sacrifice and suffering in order to overcome death ultimately and attain eternal life. So from these three gifts of the wise men who came from the east, St. Matthew teaches us all to give God nothing but our best, excellence in all our endeavours, the devotion and adoration that is due God only, and the acknowledgement that only in a life of sacrifice and even death with Christ Jesus is there victory over death for ever. 1.5: Now permit me to address a word from this episode of the Magi to our deacons to-be! Every seminarian starts his journey towards the Holy Priesthood with the appearance of a star; a desire to become a priest. With the help of the formators in both the minor and major seminaries, with the help of family and friends, with the help of their priests, and even at times with the help of people unknown or most unexpected, if we listen attentively, God shows us what he would want of us and directs our paths towards the house where we encounter God in the person of Jesus Christ. This evening, as you are soon to be ordained deacons, the final and most decisive step towards the Holy Priesthood, and who knows, maybe one day on to the episcopacy, the fullness of the Priesthood of Jesus Christ, Priest, Shepherd and Teacher, I can say that the star that sometimes appeared and even disappeared during your preparation in the seminaries, has now reappeared forcefully, and it is pointing you to the house where Christ is waiting for you with his Mother Mary and Joseph. This evening, Jesus Christ is going to ask you for something deeper and more spiritual, or of even greater value than gold, frankincense and myrrh. Soon, Jesus is going to ask that you become like him, chaste, obedient and poor so that as his minister/servant, you will be indeed Christ-like, and people coming into contact with you may come to know and encounter Jesus Christ the Way, the Truth and the Life in your person. My dear friends, you are going to make your commitment to a life of celibate chastity; you are going to make a firm promise of obedience to the Holy Roman Catholic Church in the presence of the Archbishop, and you are going to be required to live a Christ-like life of poverty. In these three virtues of chastity, obedience and poverty, Jesus will require nothing less of you than the Magi brought. Out of your treasures, you will offer nothing to Jesus Christ the King of Kings, Lord of Lords and Saviour but the best, gold representing excellence in your ministry; you should do everything in deep devotion and adoration of God, represented by the frankincense; and you must be ready to sacrifice your life accepting to suffer like Christ did for the salvation of those you will be sent to as deacons, and later on as priests; this is represented by the gift of myrrh. I hope, in fact, I exhort you after this ordination that, you continue to meditate on the story of the Magi and ask the Lord our God to lead you into its still deeper and more mystical meaning for your ministry as deacons and priests in the near future. May Mary the Virgin Mother of Jesus Christ and Mother of all Christians intercede for you our deacons to-be and for us all Clergy, Religious and Laity, so that we will be truly sacraments of Jesus Christ the Servant of all, the Eternal High Priest, Teacher and Shepherd!